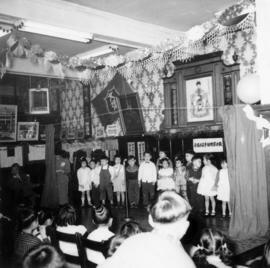 "Not for ourselves alone": 50 years at York House School, 1932-1982. A Practical Treatise on the steel square and its application to everyday use ... in two volumes by Fred T. Hodgson. "an examination of the present status of the Vancouver School of Art in relation to education in British Columbia, with recommendations concerning immediate needs and progressive expansion." The King Edward Campus story. A unique variety of programs are provided for a unique clientele. Programs, projections, tables -40 pages, appendices with statistics, map, graphs, projections. Cavalcade. (Yearbook). Vancouver, B.C. Annual. Crofton House School, the first ninety years, 1898-1988. "Every society, no matter its cultural, economic or social background, can and must stop violence against children. . . ." Informational brochure for institute located at 101 - 1001 West Broadway, Vancouver.